The Patented PoundPuncher weight loss bracelet is a perfect tool for helping you accomplish your desired weight. It's your 24/7 accountability partner. It’s the perfect tool for anyone striving to live a healthier lifestyle. 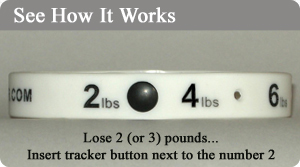 As you track your weight loss by moving the tracker button, you feel a sense of accomplishment and it enables you to stay focused on your ultimate goal. 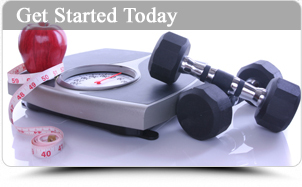 To reach your weight loss goal, it's important to make wise decisions about eating and physical activity every day. It's a simple strategy, but in today's hectic world it's easy to get derailed from the good intentions. Our motivational bracelets help you to stay focused on your goals in small realistic steps while encouraging healthy lifestyle changes. It is possible to change, all you need is a little weight loss bracelet motivation! Research shows that small, specific changes in your eating/physical activity habits have positive effects on your health. Begin with small incremental changes that you can stick with for the long-term, those small changes will ultimately lead to big results. Focus on small, short term goals that will lead to big, long term results. Looking for a creative way to help motivate others during their weight loss journey? Let us help you CUSTOMIZE your bracelet using your logo/website/message with any number combination printed on band. Free Shipping: Purchase 2 or more bracelets. USA only!